While there are consistent pest problems throughout the year, the jobs we find ourselves doing in January are much different from those we do in June. In order to properly enjoy your Summer and make the most of your garden, you have to be ready to tackle the biggest problem of all: wasps. Wasps are more problematic than bees. They are more aggressive, less helpful for the environment, and let’s face it; less cute! This blog will outline the Summertime wasp problem and explain the best methods for you to deal with it. When it comes to dealing with a wasps nest, the best way to deal with the wasp nest is to contact us. 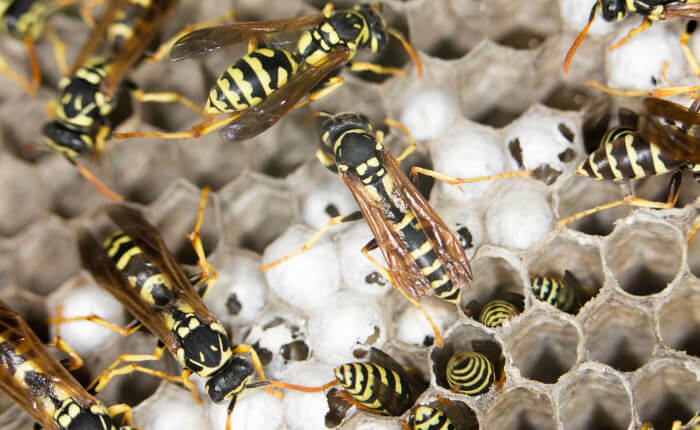 Wasps can be aggressive, and their stings can be painful, but we have the equipment and experience to make the situation relatively straightforward. Our company prioritises training for our staff leaving them in a fantastic position to deal with any pest problem they will come across. Give us a call on 0800 808 5615. In the Springtime, fertilised queen wasps will emerge from hibernation and attempt to find a new suitable location to build a nest and raise a colony. Now that we are in the summer people may start to be aware of wasp-related problems within their home. Individual wasps visiting your home are annoying, but they may just be passing by, perhaps scouting for food. However, if you are coming across wasps every day, this might be indicative of a nest inside the building, and it may require professional attention. Wasps may build their nest in sneaky places such as cavities in walls or in your loft, or in more obvious locations such as a garage or under eaves. You will be able to locate these nests most easily from late June onwards as the nests will be of significant size and the insects can usually be spotted working outside as they repair and maintain their home. 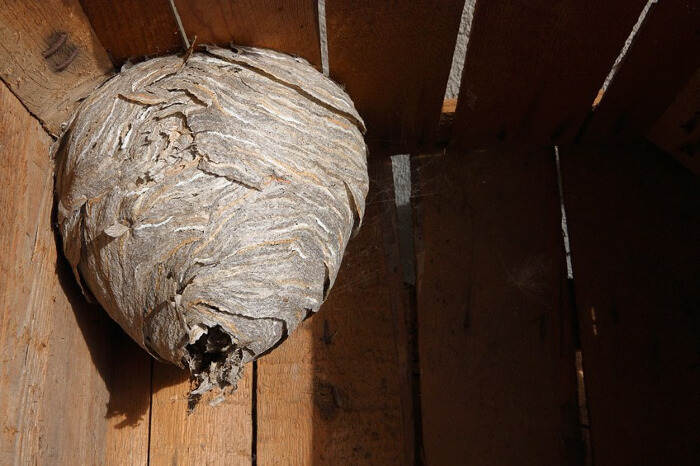 While it is best to hire a professional to deal with a wasp nest, there are some steps you can take to alleviate typical summertime problems. Traps: If you enjoy eating outside while it is warm, wasps can be a severe When there is food on the table, the wasps will hover around and ruin your meal. Leaving traps around, either homemade or bought, will attract wasps inside where they will die. Traps have their own issues, however, and while they can help they will not get rid of a nest. Insectivorous Plants: One of the more interesting methods of wasp prevention is to employ some insect-eating If you are being bothered by wasps in your greenhouse, for example, leave a few of these strange plants around. They will naturally attract and kill the wasps. Can I Deal with Wasp Nests Myself? We do not recommend tackling a wasp nest by yourself. This is especially true in July and August as the nests are at full strength, making them very tricky to address without the right equipment and training. You should also be aware that wasps tend to ‘follow’ you so that if they feel they are under attack, they may give chase. This aggression means that even after you have moved away from the nest, they may carry on a sustained attack. This is why dealing with wasps has such potential to go badly. Furthermore, removing a nest is not going to solve the problem. While you might see some instant results, the chances are that many wasps will not be in the nest when it is tackled. Many of the wasps will have been out scouting and foraging, meaning they will not die during your attack. This is why our technicians will treat the attachment area after removing the nest, ensuring that any surviving wasps will meet the same fate eventually. You should also consider the real risk of anaphylactic shock. It would take hundreds, even thousands, of wasp stings to kill the average human, but about 8% of the population suffers from anaphylaxis. This condition means that you can have a severe reaction to the venom, which can potentially be fatal. What makes this particularly problematic is that you will not know for sure if you are allergic until you get stung. Your reactions can also very, meaning while you might have been relatively ok the first time, a second sting could prove to be much worse. It is crucial that you do not take this risk when you do not have to and leave it to us. We have the practical experience to undertake the work effectively, quickly, and safely. If wasps are ruining your summertime fun, it is time to call in the professionals to deal with the problem. It is not unusual to see a few wasps in the garden; this is to be expected, however, if you are finding multiple wasps on a daily basis and find yourself swarmed whenever you try to enjoy the garden, the problem has become serious. To call out our technicians today, or to schedule in your free survey, give us a call on 0800 808 5615. Alternatively, fill in the contact form to the right of this page, and one of our staff will be in touch as soon as they can.